Hazeltown is a small portable layout built by Society members for children to operate and learn about railways and the dangers of playing on them. Based loosely on a combination of features on ‘Underground Ernie™ and ‘Thomas the Tank Engine™, along with a standard mixture of OO scale and ‘supersize’ figures from the ‘Lego™ range, this layout has a mixture to get children interested. 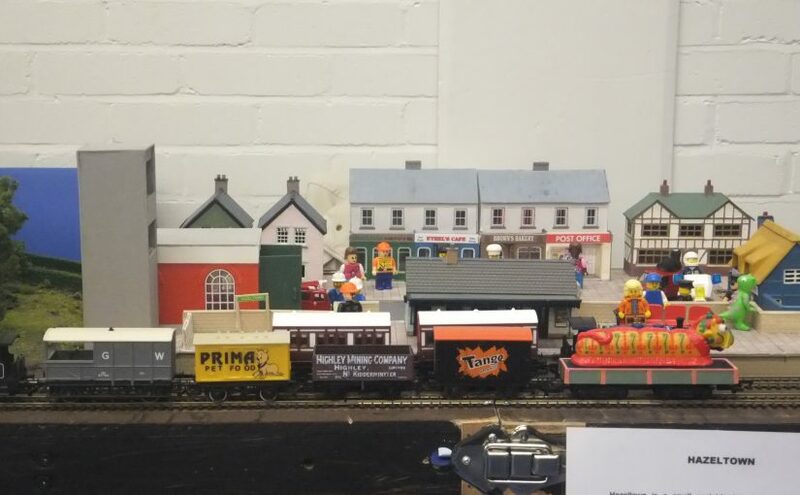 The layout made its debut in 2015 at our annual exhibition where we allowed children to drive trains free of charge and it certainly proved popular. A young train driver. Parental permission given for use of image. However, for a year or so we had a problem with storage and transporting the layout and this resulted in remedial work having to be done from time to time. This was resolved soon after the 2016 exhibition by making a trolley on which to store and transport the layout, but this meant shortening the boards slightly and modifying the scenics accordingly so that the layout would fit into a car with its back seats down. Many of the buildings are modified kits, while the scenics are totally scratch-built to fit the approximately 8ft long by 2ft wide space. In front of the shops we have a bus stop for ‘Bertie the Bus™’ and a pillar box for ‘Postman Pat™’ with road space for his van. Behind the railway station we have the police station, while opposite the police station we have the fire station. “Smokey Joe” steam engine leaves the tunnel with a brake van in tow. The track plan is a simple oval with a passing loop at the front. Starting at the left-hand front end, the track curves round through ‘Hazel Wood’ before passing under the road over-bridge in the far left-hand corner, then along the rear edge behind the houses, shops and pub. From there the track curves round again by going into a tunnel under ‘Windy Miller Hill’, on top of which is a windmill with rotating sails, which are now motorised using a 1.2V battery. The track leaves the tunnel and returns to the front of the layout. Children operate the trains using a Gaugemaster™ Model W hand-held controller at the front of the layout. The passenger train leaves the station in an anti-clockwise direction, first passing into the tunnel underneath Windy Miller Hill, then running along the back edge behind the pub, shops and houses and under the road bridge, through Hazel Wood, before passing ‘Fireman Sam’s™ fire station and back into the station. The goods train, complete with its ‘dragon wagon’, goes in the clockwise direction, passing ‘Fireman Sam’s™ fire station before continuing through ‘Hazel Wood’, under the road bridge, behind the houses, shops and pub, then into the tunnel underneath Windy Miller Hill and back to the front of the layout. Dragons do travel by train! At our 2016 annual exhibition, we made a small charge per driving session, with all money raised being donated to the BBC’s ‘Children in Need’ project. Initially, after the exhibition, it was intended that a nominal charge would be made for driving sessions each time the layout went out on tour, with all monies raised being donated to a children’s charity, but this idea was soon withdrawn at the committee’s request and a request for donations made instead. This has proved more beneficial. After the 2016 exhibition, a list of work required and features needed to improve the layout was drawn up and all were completed. At our 2017 Open Day we were visited by the Manchester Model Railway Society and asked to display our layout at their Christmas exhibition. It was at that show our windmill sails first rotated, and they created much interest. Donations raised went to help buy a special minibus for disabled children. At our 2018 exhibition donations on the Sunday were 1p less than those on the Saturday and all the money raised will be donated to a charity of our choice in due course. The Hazeltown bus is on time! The objective of the layout now is to keep it maintained and operational and available for children to operate it as and when it is needed.